I Have Refered Friends And Will Continue To Do So. 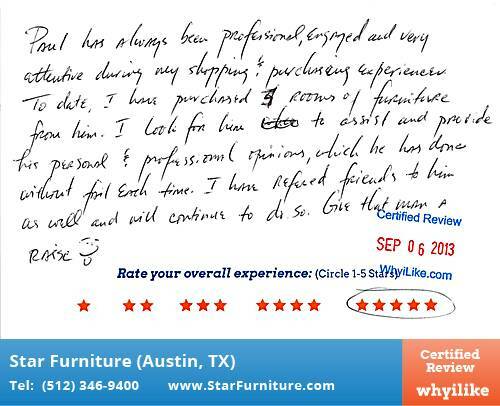 Paul has always been professional, engaged and very attentive during my shopping & purchasing experiences. To date, I have purchased 4 rooms of Star Furniture from him. I look for him to assist and provide his personal & professional opinions, which he has done without fail each time. I have refered friends to him as well and will continue to do so. Give that man a raise!